An irate reader sent us this photograph of a display in the new, government supported bakery in Yuendumu: Surely, this is not in line with the purpose of the taxpayer funded initiative, the reader said. However, Darren Clark, of Remote Food Solutions, which is linked with the Wicked Kneads bakery in Alice Springs and manages the outlets in Yuendumu, Hermannsburg and Papunya, disagrees. He says all dough for the sandwiches, wraps and rolls baked in the bush communities is high fibre and a diabetic range of cakes will replace the ones with a lot of sugar. “You can’t be telling people what to eat,” says Mr Clark. “The communities own the shops. They need to be competitive. Sweets are available in other outlets there, out of the freezer. The three shops, which provide fresh rolls, pies and pasties low in salt, will soon launch bakery training for 12 people each. The shops received seed funding from the Federal National Strategy for Food Security in remote Indigenous communities. Says its website: “The strategy aims to improve the food security of Indigenous people living in remote Indigenous communities, and provide a secure, sustainable and healthy food supply to remote Indigenous communities, as well as promote actions aimed at increasing the purchase and consumption of healthy food. A spokesperson for the Department of the Prime Minister and Cabinet says: “The Australian Government funded the construction of the bakery in Yuendumu. “The Government has not sought to control the way the bakery operates, nor does it intend to subsidise its ongoing operation and as such, it has to be a commercially-viable business. “However, the Government understands the bakery will shortly be offering sugar-free options and other healthy food products such as tubs of fruit. I visited Wicked Kneads at Yuendumu yesterday to see for myself what all the fuss was about, and what did I see? Loaves of bread in racks, but also cakes and pastries, pies and sausage rolls, chicken and chips, fried spring rolls, big bags of lollies on a display rack behind the counter, and not a vegetable nor a piece of fruit in sight, nor any local trainees. Why is all the investment of Federal and state governments, the good effort of doctors, nurses, nutritionists and community residents to promote and foster a healthy environment allowed to be undermined in this way? Who is responsible for monitoring these rubbish food outlets? Speak for yourself, Pete. Here in Alice (albeit limited and expensive) we have the option to eat healthy food and be educated on the value of nutrient dense vs nutrient poor foods. If you’re one of those meat pie, hot dog, cake eating smoko types then I can assure you if you keep that up, you will encounter dietary related health problems. Don’t make excuses for recklessness. The cost to the taxpayer for those with serious health ailments such as diabetes, heart disease, liver cancers (caused by too much refined sugar) as a result of living on this crap day in day out is enormous. Fresh veggie juice and salad bars in communities would have been a better option, and much cheaper in the long run. Can all of those above who consume only low fat, low sugar, bland food and have immaculate health and dietary habits step forward. What … no one? Seems a little hypocritical and condescending to be preaching to others while you are having you cake and tea mid morning and a coke and pie for lunch. I may be naïve but I am pretty sure people are not going to base every meal of the day around the bakery. Education is the key to better health and dietary choices. A quick glance of the general population would indicate not many of us have taken much notice of all the health messages out there (Australians are one of the most obese nations in the world and that includes all of us). It seems like another case of “do as I say not do as I do”. Great points Bob, and well articulated. What we have here is a food options being created in communities through these bakery’s and those options (including pies, pastries, doughnuts and cakes) being some of the most nutrient poor foods available. So Darren, we should be rejoicing that the sickest and unhealthiest people in Australia now have their option of more cheap, nasty and rubbish food? The only person that looks set to gain from this is you. For remote Indigenous communities, nutrient dense food (including macro AND micros) are essential to overcoming the serious, life ending health problems that currently exist because of a lack of access to proper nutrition in these areas. This whole process is shameful. Erwin, can you explain why this article was taken down? More exposure is needed to highlight this problem, not less. “And besides, Coca Cola has been sold for ages in these communities. No-one seems to be complaining about that,” says Mr Clark. You should get out more Dan. Every health service, clinic, health promotions officer and health practitioner worth knowing about has been complaining about this for decades. And it’s not just the sugar Dan: the carbs, salt and fat in low sugar bread and cakes are almost as bad for people people prone to obesity, diabetes, high blood pressure, heart disease and kidney failure. These people are battling to decrease their consumption of delectable breads and cakes, and it is by no means easy for them to win this battle, as their body chemistry makes many of them addicted to these carbs and the sugar / fat / salt. It is frankly highly disturbing that government agencies and “service providers” such as Mr Clark can be so out of touch with best practice in relation to nutrition that they remain oblivious about some of the most basic tenets of improving health outcomes for remote communities. I’m stunned to see the range of pastries and cakes on display at the Yuendumu store, and had the best cream apple turnover ever. BUT this is not the sort of food that should be on these communities! Who pays for the end results of excess sugar and fat consumption Darren, the tax payer of course, and I’d rather my taxes be better spent. Any responsible policy would be aimed at minimising rather than increasing the amount of very salty, fatty, high carb and highly sugared products being sold through these stores. Whoever dreamt up, approved and organised subsidies and other government assistance for this foolish anti-health project deserves to be charged with knowingly contributing to the further genocide being perpetrated against our highly vulnerable, chronically ill indigenous community members by promoting the consumption of products which are the opposite to what they should be promoting. Must be another “mate” of the current government. No tender, no checks, well no worries for the selected few. Great there are now these facilities in the communities but again all paid for with tax money WE provided. IF Mr Clark thought he had such a great business model why could he not run the business without OUR money? There seem to be some serious contradictions here. Projects funded under food security need to “provide a secure, sustainable and healthy food supply to remote Indigenous communities, as well as promote actions aimed at increasing the purchase and consumption of healthy food”. 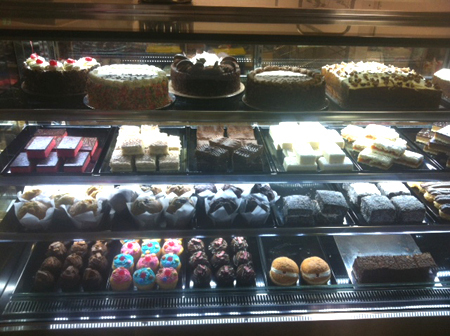 While this might have been what was sold to the Federal Government in the setting up of these bakeries, it looks very much like the NT Government has partnered very closely with and funded someone to set up a franchise to on-sell sugar and fat laden sweets to communities that already struggling with some of the worst diet-related health issues. No, Darren, you’re probably right “you can’t be telling people what to eat” but when you bid for a tender under the guise of food security, you are very much obligated to meet the brief, not set up a franchise that further adds to the diet related health issues being faced in remote communities, and create economic benefit to you from doing so. So no, Darren, while “Coca Cola has been sold for ages in these communities. No-one seems to be complaining about that,” the Territory and Federal Governments didn’t pay Coca-Cola to set up permanent sales and distribution in remote communities. Guess what – Coca-Cola did that themselves, as part of running a successful business. Tell us, how much were you funded to set up bakeries where you get to earn and retain future profits through a permanent supply chain? And the NT Government is sprouting this major success, and will be paying you to set up more. Remarkable luck there, mate. Remove the issues around how this tender was managed, simply put, this tender was won under the guise of addressing the chronic health issues in remote communities, and right now you appear to be defending the fact that you are doing the clear and obvious opposite of that. This project has potential, but right now it reeks of poor planning, self-serving objectives and rushed implementation, and until such time that a better strategy is implemented that actually addresses the key components of food security, the only long term benefits of this project will be the lining of the pockets of the supplier, and once again millions of dollars of Federal funding will miss the mark. I also wonder if any other food retailers will get the chance to actually be paid hundreds of thousands of Government dollars to set up and build extensions of their own business, to create a permanent supply and demand to line their own pockets with ongoing profits in the future? That’s almost better than winning the lotto! FFS – a bakery is selling cakes. Cue Outrage. This country has gone mad. Government money for private gain. Never saw a tender document for supply of these sugar rich disgraces. How can I set up my own Coca-Cola plant on each community as no one seems to complain? Hope this is genuine not just a get rich enterprise for the individual who pretends they care.